David is a Partner in the firm and has been in public accounting since 1973. In 1976, David and Wayne Abbott started the firm in Manchester, Georgia where he has served as partner in charge of our accounting and audit practice since inception, and in 2011 assumed the role of Managing Partner of the firm. He continues to serve as partner in charge of the firm’s quality control. David received his BS degree in Business Administration from Auburn University. 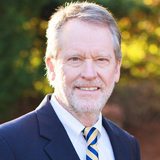 He is a member of the American Institute of Certified Public accountants, and the Georgia Society of Certified Public Accountants where he currently serves on the Peer Review Executive Committee. In addition, David is a member and past president of the Meriwether county rotary club, treasurer of the Talbot County Habitat for Humanity Affiliate, and served as Chair on the Boards of the Valley Partnership Joint Development authority, the Talbot County Chamber of Commerce, and the Tri-City Housing Authority. David and his wife, Lin live on the family farm in Talbot County. He spends his free time with his family, farming, hunting and fishing.